Everything is on the main level. Living room, dining room and kitchen. The master bedroom has a private bathroom. There is a second bedroom with another full shared bathroom beside the laundry room. Relax on the terrace and enjoy carefree Caribbean living. This offer includes: Construction of the house, stove and hood fan. 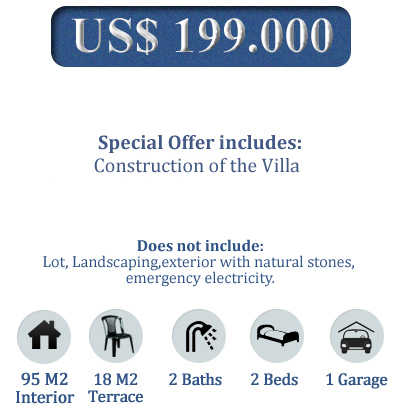 This offer not includes: Pool, Lot, Generator,Landscaping, & fully planted garden are not included in this price.